During June 1966 I put in to transfer to Birkenhead and was successful in getting the position, and remained there through the late 1970's. Bank Hall depot had been a slow one for promotional opportunities, the transfer to Birkenhead still as a passed cleaner quickly changed to that of booked fireman, my seniority allowed me to jump over three links at Birkenhead. Compared to Bank Hall there was no doubt that Birkenhead was a bigger shed, at one time split between the LMS & GWR. First impressions about the shed were how dirty it was with locomotives all over the place. Allocated here at this time were Jinties, Class 4 Tanks, Crabs & 9F's of course. The dock jobs were worked by Drewry shunters and some old Hudswells. Photograph courtesy D Sallery. Mal mentioned Birkenhead was crowded and dirty, this fine view certainly provides an indication of the conditions found at many steam era shed. A small group of Birkenhead's 9F's await their next turns. The above view brought back a few more memories for Mal as it provided a contrast between Bank Hall & Birkenhead. On arrival at Birkenhead I was surprised at the number of locomotives at the shed. The old messroom was jammed packed with footplate men. From all over; Aintree, Walton, Brunswick, Bidston, Chester, Edge Hill and Bank Hall, I recognised some from going on loan to those depots. Some men sat outside not being able to get a seat inside, a new messhall was to come later. Bank Hall had been an eight road shed, neat and tidy, Birkenhead was two sheds in one, a mess with engines all over the place. It would be a few weeks before I took my position in the links, in the meantime I would be given any job. The worst jobs were the early morning trippers, you would have to prepare one locomotive and then your own, usually a Crab. At Bank Hall you would prepare a locomotive and that was that! Not at Birkenhead however, you got your bucket of tools, spanners, brush & gauge lamp from the stores, placed them on the locomotive, cleaned the footplate up, filled and trimmed the lamps, made sure the locomotive had the main fire irons, pick axe and shovel, the driver would oil the locomotive. You soon found out that the lazy firemen also on the prep jobs would take your equipment off your locomotive and place it on theirs. When the men came for a job engine prepared they were only allowed fifteen minutes, and booked off the shed. So quite often you were late getting off shed having had to go gather more equipment. There was an outside foreman to ensure things ran smoothly, but early in the morning in the dimly lit shed, with smoke hanging all over it was not easy. You had the Hooton, Ellesmere Port tripper, and the Bidston, Dee Marsh, Upton, Moreton for Cadburys tripper, both mainly with Crabs. BR Standard 9F No.92094 heads east through Chester with a loaded oil train ex-Stanlow on January 31st 1966. This view was taken shortly before Mal moved to Birkenhead where he would come into contact with the 9F's and Stanlow's heavy oil trains. Much has been said and written about the 9F's, they were obviously cheated out of many years of service but what they did accomplish in their brief time is certainly a fine closing tribute to standard gauge steam on British Railways. Stanier 4MT 2-6-4T 42581 poses for a photograph at Birkenhead on May 7th 1966. The locomotive is out of service, its fire irons have been tossed down the chimney and are just visible in the photograph. The reason for 42581's retirement is just visible, the rear buffer beam has been hit and bent downwards. In better times this would have been easily repaired, but not in 1966, with steam having about two years left. I met up at Birkenhead with some ex Walton and Aintree men who had transferred there, plus plenty of Edge Hill men, it was clearly obvious that Birkenhead was getting busier. Stanlow ground frame was starting plenty of scrap and iron ore trains from the docks, also all the John Summers work to Shotwick, these were at the time the heaviest loose coupled iron ore trains in country. When Bidston shed closed on November 2nd 1963 the men came with the jobs to Birkenhead. More work also came our way from the Shell fertiliser plant which later became known as UK fertiliser. Fairburn 2-6-4T (2) 42086 42121. Stanier 2-6-4T (3) 42606 42613 42616. Hughes 2-6-0 (6) 42727 42765 42782 42812 42859 42942. LMS 3F 0-6-0T (6) 47272 47324 47447 47533 47659 47674. BR 9F 2-10-0 (56) I won't list them! Both 42812 and 47272 were withdrawn during the week ending June 18th 1966 but these were the only changes that month. Two views of Stanier 4MT 2-6-4T 42616 at Birkenhead Woodside on May 7th 1966. The locomotive will work this service as far as Chester, here more coaches will be added for the run up to Paddington. These views were taken about a month before Mal transferred from Bank Hall to Birkenhead. Like many railwaymen Mal kept records of his daily workings, unfortunately this diary was not started until December 1966, so the first six months at Birkenhead are not as well recorded as the later notes. Amongst the many changes were the closures of other depots and yards which caused us to travel further in our duties. My first booked driver at Birkenhead was Alan Woods, he was a single guy who did not want to work overtime on the night jobs in the link so he would swap with a younger driver, who was only to happy to get the overtime. There was still plenty of mixed goods around at this time, plus the iron ore jobs from the docks. I remember the jobs to Cheadle, usually a Class eight, you would work the iron ore job as far as Cheadle where you would be relieved, once relieved my driver would start running to East Didsbury station for a train home, I would follow him. My guard said to me when we get relieved you don't have to run like a madman to get home, take your time stay with me, which I did start doing, so I would book off the same time as the guard, nothing was said, I still don't understand what my driver put on his ticket, maybe my booking-off time or perhaps he left it blank? One night turn I remember very well, we went on duty at 20.20 for the night Arpley turn. My mate had changed turns so I had a younger driver with me to run light engine to the docks. From here we worked to Hooton, shunt, then work to Ellesmere Port, shunt, then forward to Arpley, where we were relieved, then off we go into the shunters cabin for our break. The cabin was a busy place, always full of train crews, some going east, some going west, the shunter's name was Thatcher. The train you were relieved on the next crew would do the shunting at Arpley before leaving, so when your train arrived you would relieve that crew and shunt at Arpley before leaving. Thatcher might say Birkenhead, your train is the sixth one in the queue, it was as I said very busy. There were men from places such as Garston, Mold Junction, Heaton Mersey, Stockport Edgeley all waiting for trains, on these jobs you nearly always got a Class eight or Black Five, by the time you got back to Birkenhead you had been on twelve hours. One night on this job our return work was caped, Control asked my mate would he work a train to Crewe. We had six hours on duty at this time so he agreed. We set off for Crewe, an easy job for me, I never struggled working any of the freight jobs. I think we had a Class five on this job, we approached Crewe on the slow line and were stopped just before Crewe coal yard, I got down to go on the phone to the box, the signalman told me we were in a queue, so take a rest. We were now on overtime, we had a good sleep, my mate and I had been getting on the phone periodically to check with the signalman, still we stood there! My driver went to a shop across the way to get a paper, he was getting a bit angry having stood for about four hours now. I had never left a steam locomotive on the main line before, but my mate was now threatening this. Around ten o'clock my mate said that's enough, we had asked for relief earlier, so we filled the boiler to the top, shut the dampers, the fire was low at this time, just put some coal under door, and we left the locomotive on the main line, the signal man had informed control of our actions. We walked to the station and went home passenger, nothing was said, that's the one and only time I had ever left a steam locomotive on the main line. We booked off after midday, so we did not have to go to work Friday night, our rest day was Saturday so we could not book on that day. You were given eight hours pay and stayed off. At Birkenhead it was called a buckshee. I was with Alan Woods for the first six months then my next driver was J Kay, he appears later in the story as instrumental in getting me through the driver's examinations. Early in 1967 when Mal qualified as a steam driver, part of his test was taken with a tank, possibly it may have been 42616. Other possible candidates were 42086, 42133, 42548, 42587, 42613 or 42647. You soon got to know who were the ex Great Western men, they were in a different pension scheme which provided them with more money. They were very proud. I was told when the sheds were split they would not let on to each other walking down the road. Photographs of the turntable at Birkenhead seem to be in short supply, but this view, one of a series of postcards which included several views of Birkenhead shows 9F 92165 using the turntable. The turntable uses the vacuum created by the locomotive to assist in moving this 136 ton machine around. 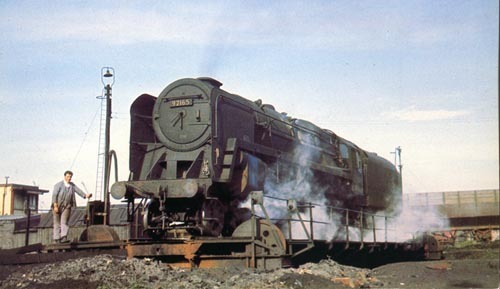 92165 was one of three 9F's equipped at one time with a mechanical stoker and double chimney. Mal's comment with regard to the above view - the photograph of 92165 is cracking pic, first time I have seen Birkenhead turntable in a photo, the fireman standing on the left has since been identified as John Lowe. Note the vacuum bag stretched out to work the turntable, the coke wagons in the background are for the gasworks. 92165 was a good steamer, an old saying for good steaming engines was "you only have to show her the shovel and she will steam", sisters 92166 and 92167 were also in that category. Working on the freights was straightforward, often spending much time going in and out of the loops to let the passenger trains pass. The Class 9F locomotives were brilliant, easy to fire, very comfortable, good riding locos. The Crabs at the depot were the last ones, a preservation society were trying to raise the money to save one, but alas they were scrapped. Our steam jobs took us to Northwich, Heaton Mersey, Stockport Edgeley, Crewe South, Patricroft, Shrewsbury and Croes Newydd. My first trip over the former GWR route was from Saltney Junction to Salop, the permenant way was excellent although I found the signals strange, somewhat similar to the Cheshire lines, drop signal for clear. And I was amazed at the ATC, auto train control, every distant signal had a ramp, if the distant was clear a bell would sound, if it was at caution a horn would sound. This was similar to later AWS system. Going off shed there was a ramp to test the equipment. Just prior to my driving test, J Kay was my regular mate at the time. He had been teaching me the passage of steam, round the wheels, etc, he had a piece of chalk and would use the tender doors as a blackboard. He said to me all the jobs we work up to your test, I will do the first half of job, and you will act as driver on the second half of the job. On this particular day we were working from Ellesmere Port to Crewe and return to Birkenhead Docks. We are on duty at 04.30am and completed the first half of the diagram, at Crewe South shed we turn our locomotive, a 9F. Then its down to the sidings where we back onto our train, almost ready to return. Johnny went off to have a brew up, the guard should be up soon to provide the loading etc. I'm sitting in the drivers seat. The guard comes up to the locomotive and gives me the number of wagons, how many fitted etc. Its a misty morning, one cannot see more than ten wagons back. The guard says we'll back on the brake and when your mate comes back we'll be right away - that's what I thought he said! What the guard actually said was 'I'll be back in the brake and when your mate comes back we'll be right away'. Any how, I'm sitting thinking may as well back on the brake now and save time, so I put the locomotive in reverse and gently started pushing back until I felt the locomotive stop. I put the reverser back to forward, and wait for Johnny. All of a sudden the guard comes running out of the mist, shouting stop! stop! I said I have stopped, he said you have pushed back and my brake van has gone foul on the hump, and has been hit by a loose wagon being hump shunted. I said you told me to push back, he said no I didn't, with all this going on Johnny comes walking up to locomotive swinging his brew can and wants to know what we are arguing about? We tell our story, I thought to myself that's the end of my driving for today. Johnny said 'Is that all that's happened?' We both looked at him. The guard said their getting me another brake, and will let us know when it's on the rear, then we can go. Johnny said to me get your cup out and have some tea. He was very casual, he put all the confidence back in me. Not all the drivers would have acted that way. Worked back to docks, I needed to work a long train like this for the experience. Nothing said about incident, at least that's what Johnny said when I asked him. Hughes/Fowler 5MT 2-6-0 Crab 42812 under the coal hopper at Birkenhead depot on May 7th 1966. In his time at Birkenhead Mal worked on the Crabs, one was used for the tripper to Bidston, Moreton and Upton. By the end of 1966 the work for the Birkenhead Crabs was diminishing, the last three diagrams were an evening Woodside - Chester parcels and two morning freights; the Bidston Yard - Dee Marsh pick-up and the Hooton - Ellesmere Port & Stanlow trips. If there was a shortage of the Class 4 tanks the Crabs would frequently fill in on the passenger services to Chester. The continued lifeline for the Crabs was the fact that Birkenhead shed had no other large locomotives apart from the 9F's and these were restricted over certain lines & sidings. The date for this working is uncertain, but could well be towards the end of 1966 when the number of jobs assigned to the Crabs was rapidly decreasing. We did not book on for this job, I was on duty around one o'clock, my driver Sid Lomax was on at 13.30 working his rest day. The foreman gave us the job, taking a raft of parcels vans to Ardwick. We took a Crab off the shed down to the carriage sidings, here we were shunting for over an hour, piecing the long train together. We departed the carriage sidings heading for Manchester, my driver knew the road to Piccadilly. We arrived at Ordsall Lane late in the afternoon, we were stopped at Castlefield Junction, I left the locomotive to visit the signalbox and sign the register. The signalman is West Indian and after the register is signed he lets me know we will be stuck here until the last passenger train on the Altrincham - Oxford Road service has arrived. He said we were more than welcome to sit in the signal box, I said I will go and tell my mate. It was around 17.30 at that time, the last passenger was after 23.00. Sid seemed quite happy with this news, being on his rest day! I filled the boiler, shut the dampers, and off we went to the box. The stretch of track we were on was only used for tripping at that time, now Castlefield Junction is one of the busiest in Manchester. The signalman was a keen cricket fan, he made us very welcome, we had our food in the box, with all the conversation the time soon went by, and the last passenger arrived. Back on the locomotive the signal clears and off we go, only a short distance through Deansgate (formerly Knott Mill) station on to Manchester Oxford Road station, and finally stopping at the end of platform thirteen at Piccadilly. I get on the phone to the power box bobby who says we'll be getting a conductor when they can find one, so take a rest! Again I shut the dampers, top the boiler up and ease the blower, and try to get comfortable. Seems strange, you can almost see Ardwick from where we are standing, anyhow I soon get fed up and go for a walk. One of the station staff tell me where I can get a pint, after hours. I go back to tell Sid, he tells me we won't be moving till about five, tells me to go for a drink. Off I go to find the pub, knock on the window, I go in and join other railwaymen for a couple of drinks and some crisps. Back at the locomotive its not easy sleeping on a Crab, very uncomfortable. About five in the morning a conductor steps on and off we go across all the points and head towards Ardwick sidings. We dispose of the train, take the locomotive to Longsight shed and then head home passenger. This would be one of the longest turns I ever worked, we booked off around nine o'clock, almost twenty hours on duty, Sid was very happy, I think his one turn was worth in pay thirty four hours. Its a sunny October 30th 1966 as 70004 stands at Birkenhead as a party of rail enthusiasts work their way round the depot. Behind the Britannia is Birkenhead Crab 42942 with a freshly painted bufferbeam and embellished buffers (see notes below). The Britannia and the Crab shown in the photograph above had been used on a railtour the previous weekend. On October 22nd the Liverpool University Public Transport Society sponsored 'The Wirral & Mersey Special' which started out with 42233 (later joined by 45015) from Liverpool Riverside to the docks and then on to Edge Hill. 45015 was removed here and 42223 then took a circuitous route via Wigan to Manchester Exchange. 70004 took over visiting a number of locations on the east side of Manchester before joining the route from Hyde Junction to Woodley, Bredbury Junction, Stockport Tiviot Dale, Skelton Junction, Altrincham and on to Mouldsworth, Helsby Junction, Hooton and Green Lane Junction. At Green Lane Junction 42942 took over, visiting the Mersey Docks & Harbour Board Line then Bidston East Junction, Bidston, Neston, Dee Marsh North Junction, Dee Marsh East Junction, Chester Northgate avoiding line, Mickle Trafford connection, Helsby, Frodsham Junction, Runcorn, Speke Junction and terminating at Liverpool Central High Level. Another view from October 30th 1966 finds Birkenhead favourite 42942 (mentioned in the previous week's railtour text above) standing in the sun, with a portion of the tender of 70004 also in view. At year end all the 0-6-0 Jinties were withdrawn, replaced by an influx of the 204hp Drewry diesel shunters. Additionally a new class to arrive were two members of the Stanier Black Fives: 44963 & 45232, brought in to replace the Crabs, more Black Fives would arrive during 1967. All of the 3F 0-6-0T Jinties allocated to Birkenhead were withdrawn at the end of 1966. 47447 was one of those, and it is seen here at Birkenhead in better days earlier in the year on May 7th 1966. The other Jinties retired with 47447 were 47324, 47533, 47659 & 47674. It might be difficult to pin down the most striking memories of the final years of steam, but the combination of 9F's, heavy oil trains and the Pennines would be one great suggestion, a combination that Mal would be very familiar with. In this 1967 view 92069 heads west at the east end of Healey Mills Yard, with a load of empties heading back to Stanlow. Becoming a driver, the Class 9F's, diesels arrive and steam disappears. Drivers were training on diesels after six months, although I was told I was going for my drivers test on steam! I had not been studying steam, I thought I would miss and go straight to diesels. Luckily enough I had an ex Edge Hill man, Johnny Kay as my mate, he had been a fireman in the London link handling Princesses, Duchesses and Royal Scots, at work he would let me drive and taught me all he knew. I just hoped I could remember it all! So in January 1967 I went for my two day test, one day on the rule book & regulations, the second day driving a passenger train and a freight train. I got the toughest inspector, Sammy Lees, who had failed the last six to take the test at Birkenhead. I passed my rules, the second day we successfully worked a passenger with a Class 4 tank from Woodside to Chester, then we went to Helsby in order to work a freight to Birkenhead. The locomotive was an Austerity, I had driven some of this type at Aintree when on loan there, on the test we had a Wakefield loco, we had a good trip to docks and I was passed for driving. Overnight I became a hero at Birkenhead after passing out with Sammy Lees, though without the help of Johnny Kay this would never have happened. I remember 92203 arriving at Birkenhead fresh from works gleaming, a good steamer, this 9F would end up preserved. Paperwork dated January 19th 1967 indicating that Mal was scheduled to start his driving exam for steam locomotives on January 24th 1967. Mal would successfully pass the test and at the grand age of 24 would begin driving steam locomotives, albeit only for a short while at Birkenhead because the depot converted to diesels during November 1967. My years at Birkenhead were the best years, I was 24 when I passed for driving, you had to be at least 23, or in London 21, for shunt driving only. My first trips were to Mold Junction. One favourite job was to Lawton Junction where we would be relieved by Stoke men. It was a strange route leaving the east end of Ellesmere Port then down to West Cheshire Junction, over the single line to Mouldsworth then back on double track down to Northwich and over the single track chord line to Middlewich, a hand token was required for the single track from Middlewich to Sandbach, train counter on track no token. At Sandbach we'd cross the main lines passing through the station, then on to single track I think it was Elton crossing and we'd come out at Lawton Junction just south of Kidsgrove. Later when the diesels came we went through to Stoke on Trent. That single line had closed and the new tunnel at Kidsgrove had opened. In mentioning Mouldsworth, the fading view below recalls a working from Mal. On July 25th 1967 I was on duty at 08.50 with Driver P Gregory, well in reality a Passed Fireman slightly senior to me. It was light engine to Grange Lane to work a train to Winnington which included the single line to Mouldsworth featured in the view below. On arrival at Winnington, we are told to take the locomotive to Northwich shed and exchange 48161 to 92021, we then work a mixed freight back to Birkenhead docks, then light engine to Birkenhead, signing off at 17.50. In this view from August 1967 Class 8F 48161 approaches Mouldsworth with an un-identified working. The driver would have the single line token. Looking back, when approaching West Cheshire box the right hand peg would be off for the single line, the train would be moving at about 15mph when the fireman received the token from the signalman, the momentum would allow us to get a run at the bank which took us over the Chester line and through the countryside on to Mouldsworth. Also at West Cheshire box is where the lead into Shellstar branched off facing Stanlow. In the far distance is Ince and Elton power station. On my third driving turn I can remember being in Ellesmere Port east end on a Saturday about midday, the guard had been up to the locomotive to give me the loading etc. I was waiting to be called out of the yard, the dummy had already come off. Eventually the guard walked back to me and said what was I waiting for. I said 'to be called out of the yard', he replied 'its Saturday and we are the only one in yard - get going'! Normally you would be called out as there may be other trains in the yard, so you don't know who the signal is for. By the end of January Birkenhead's last two Crabs: 42727 & 42942 were withdrawn, these were the last of the Class to remain in service anywhere on BR. They would join a growing number of withdrawn locomotives dumped at Birkenhead, including more Crabs, Jinties and Class 4 Tanks. At the end of February 42942 was repositioned in the yard for the attention of some local newsmen. The local newspaper, The Echo, featured a couple of articles about 42942, the second article highlighting the attempts by a group of Merseyside railway enthusiasts to save 42942 from the breakers. British Railways offered the locomotive for GBP2,500 'as and where lying and in the condition as at the date of purchase'. The newspaper reported the preservation group had only 'until the end of the month' to raise the funds. Time would run out for the fund raising efforts, 42942 would go to the scrap yard, but an example of this type, 42700 would eventually reach preservation. The diary indicates that on February 13th we took Drewry shunter 2398 light diesel to Dee Marsh, with driver J Kay. On February 15th a Brush Type 4 was succesfully tested on a Bidston Dock - Shotwick iron ore train. The last 9F's to be allocated in to Birkenhead arrived during February 1967, these were the former Crosti boilered 92022 & 92025. At the same time Class 4 tank 42548 was retired and replacement 42663 arrived. The new arrival did not fair well, on a shunting manouevre with 92065 & 92108 control was lost and the tank ran into a lineup of four 9F's & one 8F. A damaged rear buffer beam led to the almost immediate withdrawal of the tank. The first weekend in March brought a major change to passenger working at Birkenhead Woodside when the through services from Paddington ended on Sunday 5th. The final workings were handled by a variety of locomotives, D297 hauled the last Down sleeper, it then worked several other passenger turns throughout the day before arriving at Chester to bring in the last through service from Paddington (21.08 ex Chester). The other interesting day's diagram was set to be handled by Birkenhead allocated 42587 but during the afternoon this locomotive was failed at Chester. 44690 took over and handled the last workings in the diagram which included the final Up sleeper from Woodside. Station pilot for the day was 42616. Four steam specials also visited the Birkenhead - Chester line behind 7029, 44680, 92203 & 92234. From March 6th Woodside would be served by a local DMU service to Chester, on slower timings. For Mal, Sunday 5th was a rest day so he had no part in the day's events. Its the summer of 1967, the location is Ellesmere Port station and Mal is in the driver's seat of a rather work worn 9F. March 22nd 1967: light engine to Grange Lane, work to Godley then light engine to Heaton Mersey shed and home passenger. May 24th 1967: passenger to Bidston Dock, work train to Shotwick, then light engine back to Birkenhead. June 1st 1967, light engine to Stanlow, work train to Cheadle, detach train, then light engine to Godley, turn locomotive then work Godley to Stanlow and finally light engine back to Birkenhead. A view of Class 9F 92203 at the closed Crewe South shed. The date is sometime between November 1967 & April 1968, when 92203 & 75029 moved to Longmoor. As mentioned elsewhere in the text this locomotive handled the last steam hauled iron ore train to the John Summers works at Shotton. It was later purchased by artist David Shepherd and in preservation carried the name 'Black Prince'. 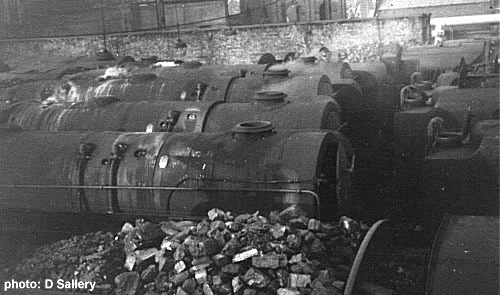 One working for the Birkenhead crews was the Stanlow - Neville Hill tanks, frequently with a 9F diagrammed for the job. In this view at Stockport Edgeley a 9F and oil train waits to head northwards, possibly this is a Birkenhead duty, but few details are known about the photograph. When the DMU's took over the local passenger workings on March 6th the Birkenhead allocated Class 4 tanks lost some of their duties, they would continue on local trip workings and shunting work, but the end came during the middle of May when the final three tanks; 42587, 42616 & 42647 were removed from Birkenhead's allocation. 42647 was withdrawn, the other two transferred to Low Moor. These moves left only Black 5's and 9F's as Birkenhead's remaining steam allocation. The Black 5's work frequently included local trip and shunting work. On March 25th 1967 Mal booked on at 05.55 taking 8F 48119 light engine to Birkenhead Docks to then work to Holywell, detach here then light engine to Tattenhall Junction, picking up a train in the sidings to work back to Birkenhead Docks, then light engine back to Birkenhead, signing off at 15.50. Signing off generally occurred between 11.10 & 11.20 am. On April 19th signing on was at 02.50 to join driver R Warburton on 9F 92101 light engine to Dee Marsh to work two round trips from here to Ellesmere Port east end. Then back to Dee Marsh with a train, drop it off and light engine back to Birkenhead, signing off at 13.50. The next three workings all began with a light engine movement to Ellesmere Port east. On April 24th signing on was at 12.45 to meet up with driver J Gray and 9F 92122. From Ellesmere Port it was off to Lawton Junction via Northwich, Middlewich and Sandbach where we were relieved and went home passenger, signing off at 21.50. On April 28th signing on was at 13.05 to join driver J Gray and 9F 92082 for a trip to Stoke on Trent via Northwich, Middlewich & Sandbach. At Stoke the 9F was worked to the shed, then home passenger, signing off at 23.35. On June 28th signing on was at 19.53 to join driver Johnson and 9F 92165 to work to Godley, then light engine to Heaton Mersey shed. Then it was home passenger, signing off at 07.15. It was a partial diesel turn on June 29th, sign on was at 19.30 to work D1806 light engine to Crewe Diesel, walk over to South Shed to find 8F 48131, light engine to yard to attach train to Mold Junction, then light engine to Chester for a job to Bamfurlong, where we were relieved and then home passenger, signing off at 08.15. BR Standard 2-10-0 9F No.92073 at Birkenhead on July 2nd 1967. Outside the shed on the right is the Shedman's cabin. This was very busy at the time with two Demic drivers and firemen on the day shift, turning and shedding locomotives. A Demic driver could not go out on the main line, most likely due to eyesight problems, glasses were not allowed in steam days, except on shed and diesel shunts. Digressing slightly from the steam turns, during the third week of June Brush Type 4's trialled on the early morning Bidston - Shotwick iron ore train. Locomotives used 19th - 23rd respectively were D1802, D1947 twice & D1838 twice, on 24th steam returned to the working. Although the diesels performed well one side effect of handling these heavy (1,000 tons+) was the incidence of loose tyres. Until this problem could be resolved at least for the summer months steam remained in charge of these workings. Saturday July 1st 1967 at Stockport Edgeley, 9F's 92025 & 92048 have just finished taking on water and struggle to get their train moving. Of interest are the signalbox to the left and the four way diamond crossing to the right. 92020 - 92029 were initially built with Crosti boilers and preheaters, eventually all would loose these special features. For July 8th it was a straight forward out and back turn, sign on at 13.25, take 9F 92110 light engine to Stanlow GF and then take train to Northenden Junction. Footplates were changed here, 92022 did the exact return working out, signing off at 21.10. It was another Ellesmere Port east job on July 19th, signing on at 23.05 meeting up with driver B Foreman and 9F 92011 to go light engine to Ellesmere Port east. From here we take the train to Dewsnap and Guide Bridge. The train is left here and we return light engine to Birkenhead, signing off at 08.35. My first driving turn occurred on August 7th 1967 conducting Crewe men, Ellesmere Port to Helsby where we run round the train and head for Chester. There is a brake van at either end, its a mix of vehicles for the North Wales coast; oil, gas, chemical, tanks, dangerous goods. This is the same train that ran away into the platform at Chester in 1972 with D5028. The train would run as Ellesmere Port to Mold Junction. Booking on for all this week was at 16.40, signing off varied, this day it was at 02.45. 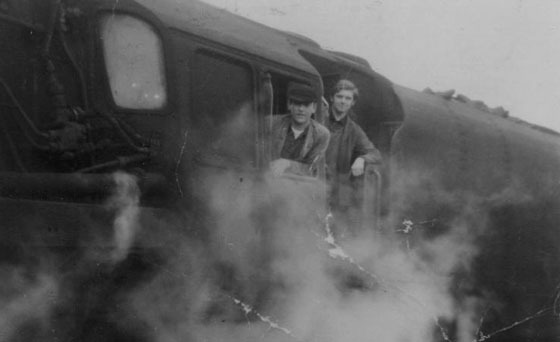 August 8th along with fireman R Corkhill I was in charge of 48684, after preparation at Birkenhead it was light engine to the docks, work to Arpley where we are relieved, then conduct Heaton Mersey men to back to Ellesmere Port, signing off at 01.35. The work of August 9th is the same as the day before, we have the same 8F, on our return to Ellesmere Port we have 9F 92082, signing off at 01.45. The August 10th turn is the same as August 7th, conducting the Crewe men, signing off at 00.30. Whilst Mal was busy working local turns on August 10th (see above), 9F No.92047 was photographed heading westbound at Stockport with a train load of empty 45t tank wagons and brake van headed for Stanlow. 92047 was of course an 8H Birkenhead allocated engine and would remain at the depot until it closed to steam. On the same day afew miles to the north at Stalybridge, D185 arrives with the 11.00 Liverpool - Newcastle service. The Class 46's were long time performers on the Trans-Pennine route, and after Mal moved to Edge Hill he would have worked many times over this route. But oh what a difference between the secondman stepping into the cab of this locomotive as opposed to him stepping on to the footplate of the 9F above! August 11th was a little different, 92112 is prepared, then light engine to the docks, work to Arpley where we are relieved. Then its a walk to Dallam shed, to pick up a locomotive 48305 and off to Arpley to work a train to Chester where we get relieved, signing off is at 06.55. The work for September 11th is straightforward, sign on at 07.40, find driver R Simpson and 9F 92109, then light engine to the docks, pick up a train and work to Northwich. Here we detach, turn the locomotive and take a train back to the docks, then light engine to Birkenhead and sign of at 17.00. On September 26th its a day of tripper jobs. Signing on is at 08.30, joining driver J Watterson to go passenger to Bidston. Here we relieve the tripper worked by 44859, which handles the Moreton/Upton/Bidston trips. When these are complete its light engine back to Birkenhead, signing of at 15.30. And finally from this block of memories its September 30th and signing on is at 08.30. With driver J Hindley and 8F 48170 its light engine to Ellesmere Port east, to work a train to Patricroft where we are relieved. At Patricroft we take D291 from the shed light engine to Chester. Sign off is at 18.35. Now into October and on the 2nd its signing on at 19.25 to conduct Shrewsbury men from Birkenhead to Chester, then its home passenger and sign off at 05.45. For the next three dates - 9th, 11th & 12th sign on was at 10.25 with fireman P Pleavin to prepare the locomotive, then light engine to Ellesmere Port to work a train to Northwich. All three days ended up a little different, on 9th the job was cancelled after we'd reached Ellesmere Port with 9F 92123, so it was light engine back to Birkenhead and sign off at 18.10. On 11th we took 48182 and the train to Northwich, then light engine to the shed and home passenger, signing off at 21.20. The 12th was similar but after finishing the job at Northwich we returned 92071 light engine back to Birkenhead and signed off at 18.45. Its the end of the road for Crab 42727 & Jinty 47324 at Birkenhead sometime during 1967. The connecting rods have already been removed from the Crab, all that awaits now is a tow to the breakers. By this time we were starting to get diesel jobs in the link, typical would be passenger to Chester where we would relieve the crew off a Holyhead - Crewe parcels. We'd take a break at Crewe and then work a steam turn back to Birkenhead, this diagram would get the men used to driving diesels. One strange job was the Sunday cattle train to York, we would work it as far as Patricroft. As well carrying the cattle you also carried a drover on this job, every time you stopped he would walk down train with a stick poking the cattle to make them stand up. The cattle wagons were white piped, blow throughs, no fitted brake on the wagons. We were told we were going all diesel at the end of 1967. I remember coming to work the first day, all the steam locos were in Hinderton Field next to the shed. And the diesels were all lined up, I had a GWR man as as my regular mate, he was very, very enthusiastic about anything Great Western, he even had an old GWR cap badge. He drove me mad, he would talk about the Bordesley job, they used to have Birkenhead Western yard to Bordesley, lodge here and work back the next day, motive power was Hall and Grange locomotives. I did enjoy working over the ex-GWR lines, very smooth running track and well engineered. It was always a pleasure to take the route over Chirk viaduct with the canal alongside. BR Standard 4MT 4-6-0 No.75011 at Birkenhead shed on May 7th 1966. To the right is the coaling plant and in the background is evidence of the industry that provided much of the freight traffic hauled by these locomotives. As a prelude to the dieselisation of the duties at Birkenhead, the opportunity was taken to clear the shed of most of its withdrawn steam locomotives. In most cases the steam locomotives were removed to Speke during the morning of October 29th in small convoys of two or three locomotives. Reported movements include 92045/106/131 headed by 92084 and 92127/151 behind 92021. 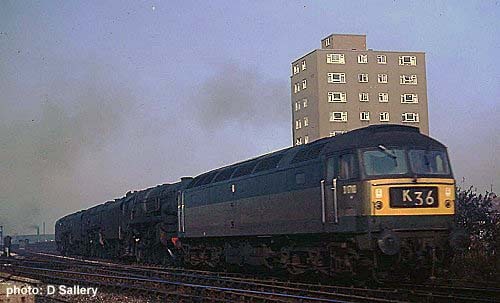 To replace the 9F's and Black Fives ten English Electric Type 4's D200 - D209 were transferred from the Eastern Region to the Western Lines and approximately fifteen Class 47's were transferred to the Western Lines from Bristol or Cardiff. Also slipping away into oblivion were two long time residents of Birkenhead, Crabs 42647 & 42942. Despite attempts to publicise these machines, 42942 in particular, they were hauled away to the scrappers. When Birkenhead became diesel only it was not just a case of retiring afew surviving steam locomotives, there remained a total of forty four steam engines allocated, ten Black Fives and no less than thirty four 9F's! Such was the quickening pace of the run down of the steam fleet in general that only six of these locomotives saw further service - 9F's 92069/088/094, 92160/165/167, and mostly of a very short duration. This was a momentus weekend for the Birkenhead area, it started on Saturday November 4th with the closure of Woodside station. At one time this terminus had sent trains and through coaches to many distant destinations as far away as Dover & Bournemouth. However at the time of closure services were limited to local DMU's operating to Chester & Helsby. After the closure of Woodside the new terminus became Rock Ferry. This was also the last day for regular steam working from Birkenhead depot. Five turns for steam were recorded on this day, including Brittania 70023 'Venus' on an afternoon freight to Warrington. The next day over at Birkenhead depot the sad task of removing the final steam locomotives was taking place. 9F's 92024, 92101 & 92113 were towed away by D1710 (see picture below) with help from 48465. Once these were gone only 44913, 92167 & 92203 remained. The two 9F's were being retained for a special duty on Monday November 6th, the working of the last steam hauled Bidston - Shotwick iron ore train. On the day it would be 92203 that was immaculately turned out for the last working, 92167 being the standby locomotive. The locomotive carried a special headboard 'Summer Ore', Sir Richard Summers was in attendance on the footplate and the working drew much attention from the print & TV media. Photograph courtesy D Sallery Three of Birkenhead's stalwart 9F's begin their final journey: 92024, 92101 & 92113 behind Brush Type 4 D1710. 92113 had been withdrawn during the first week of October 1967, 92101 had been retired during November 1967 and 92024 remained in service until Birkenhead closed to steam. With the departure of the 9F's the Shotton ore trains were initially worked by a variety of Class 47's. However as mentioned earlier these locomotives suffered from loose tyres whilst handling these heavy trains. It would be left for paired Class 24's to take over the brunt of these workings. Which is an interesting irony because Gateshead allocated Class 24's were also handling the iron ore trains over the heavily graded Consett route. Not sure of the date for this view, but present are 45156 and an unidentified 8F, with the cab front of a Class 25 just creeping into the extreme left side of this view taken at Edge Hill. It looks like 45156 is receiving a good cleaning, possibly prior to working a railtour perhaps. This named Black Five is one that Mal remembers firing/driving. Mal's notes recorded his first workings on the newly arriving diesels. Obviously at Birkenhead the earliest diesels included the shunters working in the docks. On November 7th 1967 D2199 was used for training at Birkenhead docks. Birkenhead went all diesel on November 5th 1967. At this time the LMR mainline diesel allocations were by 'Division', which for the Birkenhead turns meant that they would generally see locomotives belonging to the Stoke, Liverpool and Manchester Divisions. We were always short of power at Birkenhead. The Western Lines pool of locomotives did not seem to work well. On our trips acros the Pennines to Healey Mills we were always amazed to see rows of Class 37 diesels standing idle, the shed allocation would have been a lot better for us at Birkenhead. The first job at Birkenhead was on a Type 2 D5139 after booking on at 02.40 then going light diesel to Ellesmere Port, west end. From here it was down to Crewe, home passenger and booking off at 13.10. The 2nd was booking on at 19.00, passenger to Patricroft then work D5030 to Ellesmere Port and light engine back to Birkenhead, book off 08.10. The 3rd & 4th workings involved D5002 and D5083. November 22nd 1967 found us going light diesel from Birkenhead to Stanlow & Warrington, here we walked to Dallam shed which was soon to close, we had to take a diesel light engine back to Birkenhead, the locomotive in question was 1733 in its unique blue livery, it carried no other markings. It was a night job on November 24th, signing on at 20.10 to go passenger to Patricroft, then light diesel off shed to Newton Heath MPD, with D399 and conducting my driver, then light diesel back to Patricroft with D5083, to work to Ellesmere Port, drop the train here and light diesel to Birkenhead, signing off at 09.45. Although steam was now officially gone from Birkenhead our work on December 6th started with signing on at 07.40 and going to Rock Ferry station with driver J. Kearns to relieve an incoming train crew. The train arrived with Black Five No.45133, we were to work forward to the docks, detach the locomotive and then work a train to Winnington, detach the train and go light engine Northwich shed. It was then home passenger and booking of at 18.10. From time to time you would meet up with railwayman who just always seemed to be in a bit of bother. Les, one of our many goods guards at Birkenhead, was one such person. He was very quiet and kept to himself, but trouble just seemed to search him out, as it did to one or two of the Birkenhead drivers too! At this particular time the guards booked on duty at Brook Street up towards the docks. Should the Shotwick turns be caped, the guards from Bidston Dock would be sent down to Birkenhead, so at this time you didn't know all of the guards personally, that would come later when they moved permanently to the shed. My mate and I's first encounter with Les occurred whilst working a mixed freight from Crewe. We had backed inside at Beeston Castle to shunt out empty coal wagons and replace with loaded ones. Whilst shunting I remember my mate saying that Les keeps going out of sight, next minute he walks up and says we have knocked the buffer stop down. My mate starts shouting to no avail, we just finish our shunting and off we go. Don't know what the outcome was! Another time, in a story making the rounds, Les was working a tank train as far as Shrewsbury. The train, equipped with two brake vans would run around at Hooton station on the fast line. This move became more frequent as the traffic from the newly opened Stanlow Ground Frame increased. At one time a spur was planned to do away with the reversal at Hooton but this never materialised. So Les detachs the locomotive from the train, the locomotive runs round and is attached now to the other end of the train. In the process he manages to cross the air pipes which no one could understand how it could be done. The locomotive is a class 47, the driver is Bobby Williams and its a night job. After setting off from Hooton they get a clear road all the way through to Shrewsbury, on passing Coton Hill box on the downgrade Bobby begins to brake, but quickly realises only the locomotive brake is working. With the train now a runaway its speed increases as it descends the bank on the approaches to Shrewsbury. Fortuitously the signals indicated a clear road through the station with the train eventually coming to a stand on the southside of station. Les was also involved in the knocking down of the buffer stops on a job to Whittington oil terminal. One long distance working involving Les was the Hooton to Bathgate car train hauling Vauxhall chassis. The Birkenhead train crew would take the train as far as Carlisle, and be relieved here, on this trip they could not find Les at Carlisle so made their way home passenger. Back at Birkenhead the foreman inquired as to the whereabouts of Les, the driver was unable to help, whereupon the foreman said no wonder, Les is in Bathgate (Glasgow)! Apparently when the Carlisle guard stepped into brake van no words were exchanged so off the train went with Les still on board. Part Three - The Diesel/Electric Years 1968 - 1980 & 1989 - ? David Sallery's site with thanks for the Birkenhead steam era views.